What is a memory? Something you have or something you have lost? These words are part of a voice-over by Marion Post, the character played by Gena Rowlands in Another Woman, my favorite film, where Woody Allen pays tribute to Ingmar Bergman and Wild Strawberries. In both movies, the main characters reminisce about their lives during their last few moments. At one point in the Woody Allen film, Marion explores a box with his mother's mementoes: photographs, books. The images come to life in his memory. And the book, a collection of poems by Rainer Maria Rilke, contains a page in which he discovers one of his mother's tears, dried and preserved on paper, at the end of the poem entitled, "Archaic Torso of Apollo": “For here there is no place that does not see you. You must change your life. I mention this because I feel it has a great deal to do with my relationship with writing, in other words, with the reasons that move my pen or my fingers on the keyboard when I link one phrase with another. I would go so far as to say that everything I have written is based on a photograph, a portrait that is the cornerstone of my existence. I look at the photograph, the only one. In the center of the photograph you can see the head of a sleeping baby, wrapped in a striped, pastel colored blanket: blue, white, yellow, white, pink, white and then blue again. A hand uncovers the face, the profile. You can see the baby’s closed eye, heavy eyelid, tiny nose, broad forehead, his temple covered by a translucent hair, with part of his ear. Above his head is a window, an open space beyond the image. A shaft of light illuminates the baby’s head and most of the blanket. That is where the spectator’s gaze falls and before that, that of the photographer, in this case, a ticket collector, not your father. The rest of the image, hidden in the penumbra, is protected by a veil of shadow. The hand uncovering the baby’s hand, my hand, is a woman’s. In the top left hand corner of the portrait, you can see a portion of her face, my face, barely lit by the reflection of the light that illuminates the baby, you. You can see a broad smile, my satisfied smile, and the smile produces an expression that can only be described as fulfilled. An eye, my eye, hidden under glasses with heavy black frames. The woman is wearing a high-necked, light woollen sweater. In the lower right hand corner, you can see one of her thighs, my thigh and a piece of pleated skirt. The arrangement of the features comprising the image –the baby’s illuminated head, the smile of the woman in the shadow, the idea of the space on the other side of the window- suggests that the train is traveling from north to south and from east to west. A keen observer would say, quite rightly, that the baby was just born a few days ago, perhaps a week ago. The woman, me, perhaps a couple of decades ago. Then there is what the light does not show. Although this photograph exists, it was not taken on a train: it was taken by my father in the cabin of an airplane that was taking us from San Antonio, Texas, to Mexico City. It was my first trip, so it was not an outward bound trip. Nor was it a return trip (although it was for my parents). It was, quite simply, a voyage of initiation. 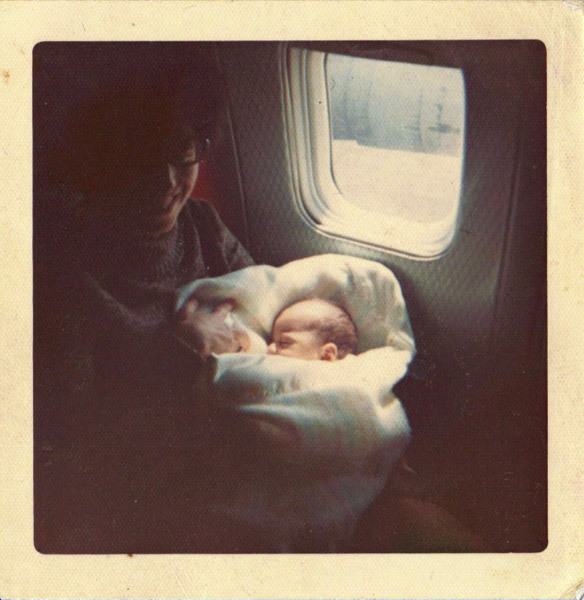 A trip that marked the start of an existence: mine as my parents’ child. I am adopted. My mother was never pregnant with me. But, as I say in the text I have just read, then there is what the light does not reveal. If the image I describe in great detail in my first novel is so important for me, it is because it represents, both actually and metaphorically, a pregnancy. The cabin of the plane in which my parents and I were travelling is in fact a uterus. And as soon as the plane leaves and we disembark, I will be given birth to. How could I have avoided turning all this into a literary motif, or literature, how could I not have narrated it or revealed it as a watershed of an existence, mine? The voice, the person who narrates and describes this portrait is the voice of a mother. The dying mother who lends meaning to The Dead Skin, whom her son visits and accompanies during her last days, during what becomes a long series of days of evocation and silence. These questions are a sort of negative waiting to be developed and returned to its positive, obvious side. However, after taking a photograph, of emptying the camera’s contents, processing them in a dark room and turning them into a printed, experienced image, time has elapsed and, in the developed light, our eyes have changed. What is it that light does not reveal? I ask now. And I don’t say much more. Let these words serve as an appetizer and give rise to a dialogue between a photographer, a writer and you, all gathered here together. |2012-08-21 18:53:30 América Pacheco - Acá me trajo la música de azar. De acuerdo contigo Ana y se lo acabo de comentar a David en tw. Es una delicia leerlo también en inglés. Le va mejor. Un abrazo a ambos por coincidir aquí, allá. Y me alegro. Me gustó, no sé por qué, leerte más en inglés que en español. Creo, no sé si me equivoque, que eres amigo del anarconde, el del Lenguaje de los machetes, mi tercer y querido hijo. Lo que la luz no revela en la fotografía es lo que asoma por tus palabras, con maestría y honestidad envidiables. Gracias. Muchas gracias. Este comentario me recuerda unas palabras de Pedro Meyer:"Yo fotografío con la memoria". Lo que la luz no revela es el sentido que el fotógrafo halló en la imagen y el que todos los que la miren le otorgarán, en consonancia con sus memorias individuales. La coincidencia de sentidos habla de la capacidad de transmitir una mirada "esencial", pero siempre habrá lugar para la creación del que mira. Si una expresión artística no provoca nuevas asociaciones, pensamientos y emociones, si no es un pivote para una re-creación, jamás trascenderá. La nota de Miklos mueve a la reflexión. El misterio de lo revelado y de lo no revelado. To apply for Payday Loans In United States you don't have to seek the help of relatives or go to a bank. But at the same time, it acts only with sexual arousal. Viagra has a number of advantages in comparison with injections in the sexual organ or other procedures aimed at treatment of impotency.